Adriane Colburn works all the time. By day she’s a technician at Stanford University’s Cantor Arts Center. 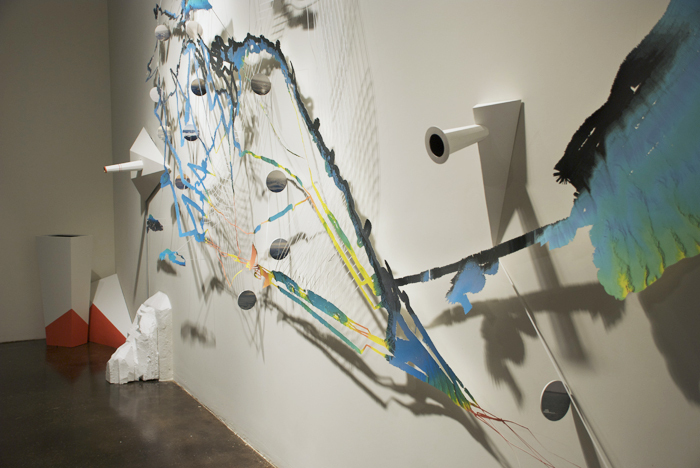 By night, she’s a renegade sculptor, pushing the boundaries of her favorite medium – paper. Colburn has long been inspired by the human impulse to visualize the world through cartography, by the act of communicating data and information through maps in order to better understand environment and processes. Maps led her to merge creative pursuits with science. “My artistic motivation is that my subject must be intellectually challenging – the result of research. Science and politics and art are all related,” says Colburn, a Vermont native who has lived in San Francisco since 1990. While surfing the Web one day, Colburn happened upon the home page for the University of New Hampshire’s Center for Coastal and Ocean Mapping (CCOM) Joint Hydrographic Center where she read about the Law of the Sea Mapping Program, an intensive, multiyear partnership between UNH, NOAA, the NSF and others, aimed at mapping the seafloor to support U.S. claims to the extended continental shelf. The arctic seafloor maps immediately caught Colburn’s attention. After reading about a 2007 arctic cruise led by Larry Mayer (UNH) and Andy Armstrong (NOAA), Colburn cold-called CCOM to find out more. The call led to a visit and the visit led to her participation in a September, 2008, arctic cruise aboard the USCGC Healy. While on board, Colburn worked as a watchstander, monitoring computers used for sonar data collection during an eight-hour shift. “The thing I was really interested in was collecting the data – the interruptions and inaccuracies. The flaws in the process are fascinating. As a non-scientist I always assumed that data collection was inherently accurate, but I became aware of the subjectivity, of the personal decisions that go into it, and how the arctic seascape determines what you can do,” she says. 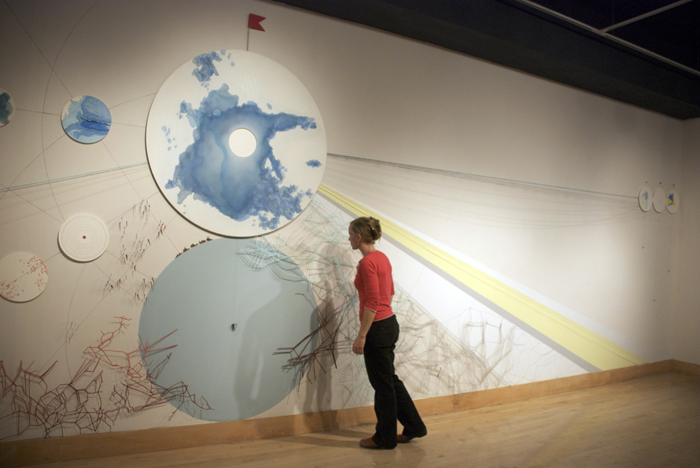 Back home in San Francisco, Colburn spent six months working up pieces for an exhibition at the Kala Art Institute entitled For the Deep, which showcased her arctic experience through a series of large, colorful installation pieces made of cut paper - arctic bathymetry maps. Round photos of the arctic landscape reminiscent of portholes dot the work. Colburn encouraged viewers to interact with her sculptures by looking into telescope-like vessels, rewarding them with video clips of the open ocean and of the Healy breaking ice. Colburn still works with scientists. She’s moved her attention to warmer climes but still focuses on climate change, measuring carbon in the Amazon with researchers at Oxford University’s Environmental Change Institute. Colburn also had the opportunity to attend the United Nations Climate Change Conference in Copenhagen. And she says she’s “trying to get back to the Arctic at least one more time,” if you happen to know anyone who’s looking to fill out a field team. Adriane Colburn’s recent work is currently on display in an exhibition entitled Earth: Art of a Changing World, at the Royal Academy of Arts in London, December 3, 2009, to January 31, 2010.